A New Year and a long overdue refurb of my website is complete. If this is your first visit, then it’s lovely to see you. If this is a return visit, then I’m very glad you took the time to pop back in. I’ve spent quite a bit of time updating my frankly tired and out-of-date website. I’m hoping that the new look is sleeker, easier on the eye, simple to navigate and most of all fun and interesting. More interactive and less passive. That was the plan, at any rate. 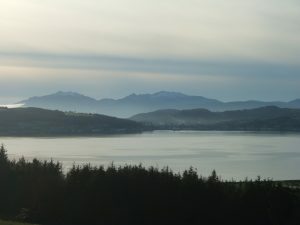 This is the full view of the header photograph, which I took from one of my favourite thinking spots, on a forestry walk above Toward Point, looking out over the Clyde estuary. You can see the island of Bute in the foreground, and the clear split between the north and the south of the island where the Highland Boundary fault runs through it (I knew my school prize in geography would come in handy eventually). Majestic Arran is in the background – can you make out the profile of the Sleeping Warrior in the ridge of the mountains? It’s not a sunny view, the weather here in Argyll rarely is, but to me it epitomises all that is beautiful about the area where I live. There’s no doubting it’s dramatic, but does it work as a banner? Do you think it’s too gloomy? Does it leave you wondering what on earth this website is about – mountain climbing, ghosts, Highland dancing, perhaps? I’d love to know. I’m a writer. I want people to read and enjoy my books, so of course I want to share lots of information about them. You’ll find excerpts and series links on the website book pages here. But I want this website to be a bit more than a vehicle to promote my books. I want to give you an insight into my life as a writer, which can be pretty isolated at times: what I’m working on; what I’m researching; future ideas; and problems I’m wrestling with (there’s probably going to be lots of posts about that). The book I’m currently writing is set in Venice during Carnival, winter 1818-19. The poets Byron and Shelley had just quit the city, much to the despair of the women and the relief of their husbands. It was a time of political upheaval, spies and secret societies, and of course the decadant, colourful, outrageous Carnival of masked balls. So that’s what I’m going to be posting about next. I know from my Facebook page that you really like the pictures I take from my many local walks and cycles, so I’d like to share more of those, and some local history too. If you join me on Facebook, you’ll know that I am passionate about food and cooking, so I thought I might share some of my favourite recipes, maybe some of my disasters too – and then you can share yours. There’s a Pinterest page of my culinary efforts here. Other things I could muse on? My renewed passion for sewing, thanks to my new machine, and knitting, thanks to my littlest nephew. Films and televison. Shoes and bags and nail polish – because yes, I am that shallow sometimes (not as often as I’d like to be). Favourite places. My ongoing battle with the deer that treat my garden is an all-you-can-eat buffet. And on it goes. Basically, what I’m saying is that the blog will feature whatever takes my fancy at the time, with a dash of what you’d like to read and chat about. So I do hope that you’ll find the time to chat, and don’t leave me as a lone voice in the hyperthingy. Did I mention that I’m needy as well as shallow? 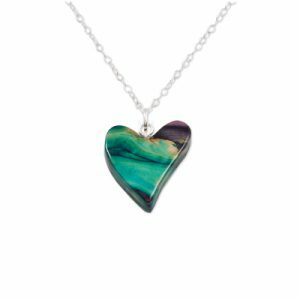 To celebrate the blog launch, I’m giving away a gorgeous pendant made of natural heather on a silver chain from Heathergems in Pitlochry. The good news is that if you’re already subscribed to my newsletter, you’re already in the draw. (You should have received a newsletter telling you about this blog if you’re already on the list.) If you’re not subscribed then it’s the easiest thing in the world to sign up, using the button on the sidebar here, or just jump to the Contact page. I’ll draw the winner on Wednesday 31 January, and will announce it here. So that’s it. The blog is now officially launched. What do you think? What would you like to read about? And what not?I look forward to chatting with you. Thanks Manda. I’m hoping that some of my pics will inspire you to pay us another visit. I like this Blog. Soon I would like to know what you are taking for your stories. If you take some ideas from real life or if they are only fantasy. If it is difficult to choose the names of the protagonists and places where to set the stories. Franca, I’d love to post on the origins of my stories, so I’ll add that to my list of ideas. I use a lot of local places for the titles of my heroes and heroines, and I have a spreadsheet to keep track to stop me using the same ones more often. Sometimes, as in my book out in March, the heroine is named ‘by request’ from a relative. Allison, in FROM GOVERNESS TO COUNTESS, was at the request of one of my cousins, though she’s absolutely nothing like her! Hi, Marguerite! I love your website and shared it in numerous places. Thanks so much for the gorgeous picture! Thank you, I’m so glad you like it. I have a book post next, and then more on Argyll after that, so hope to see you again soon. I love the header for your website; it’s kind of what I think of when I think of ancient Scotland (can’t say Scotland since I’ve been there twice now and it’s beautiful). The others’ suggestions are good ones.As for your deer problem which we have, I was told that shaving bars of Irish Spring soap and putting the shavings around the flower/vegetable beds would keep them away. I don’t know if you have Irish Spring soap in Scotland or not. Hi Trudy, I don’t have Irish Spring soap, but I have tried using ordinary, quite smelly soap in the way you sugest and it does work. The problem is that we get so much rain, I have to renew it once a week, which is a pain. But it does work. 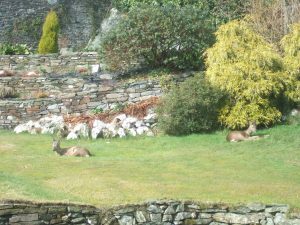 This year there are so many deer that they are eating things the wouldn’t normally touch, like rosemary and lavendar, so I’m not sure whether I’m going to do much planting. Still to make that decision. Like the Blog. I also enjoy looking at your Pinterest pages. I’m so glad you’re enjoying it. That book took a lot out of me! Love the blog and the photograph of the Clyde Estuary makes me quite homesick. 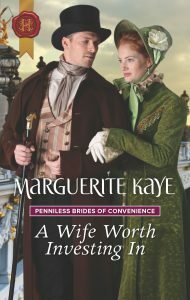 Just read from Governess to Countess and my most favourite book to date. I hope your friend Alison was happy with her namesake – excellent character? With the love of your home country and your spiritual French home could there be a story with a Jacobite theme? Hi Gloria, I can hardly see the Clyde from my window today, the snow is so thick. How lovely to hear from someone from here. Funnily enough, I do have a duet set in the aftermath of Culloden, though here in Scotland, not France (Highland Brides, you can read excerpts on the book pages). But I do have an idea for another in my ideas book funnily enough – we’ll see. 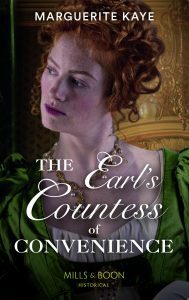 Gloria, just to let you know that I’ve entered you in today’s giveaway (a different post) for the release of FROM GOVERNESS TO COUNTESS, because the giveaway on this post is closed.